Three, two, one, happy New Yea... OK, we're not quite there yet. 1. 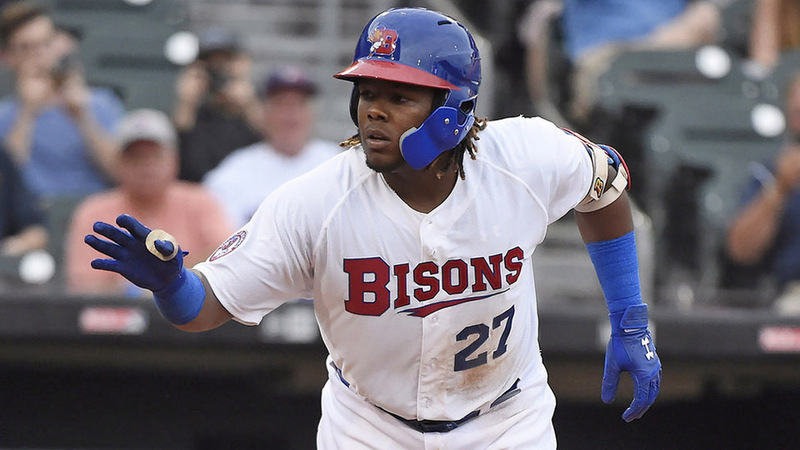 Vladimir Guerrero Jr. might be the most exciting position player prospect in recent memory. Everyone knows the numbers by now. Or they should. But hey, they are pretty numbers and worth revisiting before the winter solstice. Guerrero flirted with .400 for much of the year and finished with a .381/.437/.636 line, 20 homers and a 38/37 K/BB ratio in 95 games across three levels, mostly Double-A and Triple-A. He led full-season Minor Leaguers in average, slugging and OPS (1.073). He did all of that after turning 19 in March. It's that combination of age and true skill at the upper levels that has the whole baseball world salivating at what the third baseman can do in the Majors. He would have been there in the latter stages of 2018, if not for Toronto choosing not to start his service-time clock. When he does arrive this spring -- probably something like late April -- Guerrero is expected to be one of the game's best hitters right away. Not in a few years. Not in a few months. Right away. His glove may be lacking at the hot corner, but that's a sign of just how good the bat can be. Since MLB.com started ranking prospects in 2011, there might not have been a prospect carrying more hype in an offseason than Guerrero right now. Not Mike Trout. Not Bryce Harper. Not Ronald Acuña Jr. It's possible Guerrero's lack of defense and speed holds him back from becoming what those three are as overall Major Leaguers. But there's no doubting what the Blue Jays prospect did with the bat, and there's little doubting what he could do at the top level. He was a must-watch in 2018, and he'll be the same in 2019. 2. The Padres have the deepest system in baseball. It was close at the beginning of the season. MiLB.com ranked San Diego as the No. 2 system in baseball, just behind the Braves. Since then, the Padres system has only gotten better and deeper, and (spoiler alert) it's climbed into the No. 1 spot in terms of talent pools following the 2018 season. At present, San Diego boasts 10 Top-100 prospects, tied with Atlanta for the most in the game, and while the Top 100 hasn't been updated since July other than for graduations, this is still a deserving top group. Fernando Tatis Jr. remains a toolsy shortstop who, at 19, destroyed the Texas League with power and speed before suffering a thumb injury. Luis Urias is now a Major League infielder and will man either second or short on Opening Day because of his plus-plus hit tool. Chris Paddack was the MiLBY winner for Starting Pitcher of the Year. Logan Allen was the Texas League Pitcher of the Year. Adrian Morejon, Michel Baez, Luis Patino and MacKenzie Gore continued to flash potential at the lower levels. The organization added Francisco Mejia via trade and Ryan Weathers with the seventh overall pick to round out that group of 10. Even going beyond, there are organizations jonesing to have players like Buddy Reed, Josh Naylor, Esteury Ruiz, Cal Quantrill, Austin Allen, Hudson Potts and Anderson Espinoza in their Minor League mix. The Padres signaled last offseason that they're ready to build around this young core by adding Eric Hosmer in free agency. They don't need all of these prospects to become stars, but few saw their stocks go down this past year. Urias, Tatis and Mejia are likely to help the big club early. Allen, Paddack, Quantrill and others won't be far behind. It's always sunny in San Diego and it could be even sunnier soon. 3. The Braves are for real and have some good problems. The Atlanta rebuild bore early fruit in 2018 with the club winning its first National League East title since 2013, doing so on the strength of homegrown players Freddie Freeman, Acuña, Ozzie Albies and others. By season's end, the Braves were throwing as much talent at the Major League club as possible with Top-100 prospects Touki Toussaint, Kyle Wright, Bryse Wilson and Kolby Allard all making their debuts. Mike Soroka also made his bow before suffering a shoulder injury. Now Atlanta has six Top-100 pitching prospects with Major League experience. Only one is likely to win a Major League rotation spot next spring. Last week, manager Brian Snitker said he won't hesitate to break a young arm in through the bullpen as he did with several last year. Beyond that bunch, Ian Anderson, Kyle Muller and Joey Wentz aren't far off and will keep pushing apace in 2019. Austin Riley is blocked a bit after the club became attractive enough to sign All-Star third baseman Josh Donaldson to a one-year deal. This was the dream when the Braves started rebuilding, and through some player-development success stories, they've created some good problems on their hands with too much talent for too few spots. It should be a crowded camp in Orlando come February. 4. The White Sox are ready to roll. The big news on Chicago's South Side comes from rumors that the White Sox are chasing premier free agents Bryce Harper and Manny Machado -- a signal that the rebuild is coming to a close. A big reason for that is the expected arrival of the system's top prospects. Eloy Jimenez is right there next to Guerrero as a player who probably should have debuted in 2018 after hitting .337/.385/.577 with 22 homers at Double-A and Triple-A. If not for the son of the Hall of Famer, he might have been the most-feared right-handed hitter in the Minors in 2018. Right-handed pitchers and Top-100 prospects Dylan Cease and Dane Dunning have good chances of heading to the Windy City in 2019, if healthy. That's an important caveat since fireballer Michael Kopech made his own debut last August, only to need Tommy John surgery in September. When he does return, he should give Chicago's rotation a big boost, no matter what happens on the lineup side. It doesn't look like the White Sox are ready to wait anymore, thanks to the ascension of their best young names. 5. Name a more dynamic duo than Royce Lewis and Alex Kirilloff. We'll wait. The Twins took Kirilloff (2016) and Lewis (2017) with first-round picks one year apart, but Kirilloff's Tommy John surgery meant they'd begin their first full (and healthy) seasons together. They didn't disappoint. Lewis, the No. 1 overall pick a year ago, batted .292/.352/.451 with 14 homers and 28 steals. Kirilloff was the MiLBY winner for Breakout Prospect of the Year after leading the Minors with 71 extra-base hits while producing a .348/.392/.578 line. The pair both were promoted from Class A Cedar Rapids to Class A Advanced Fort Myers in the middle of the season. The Miracle not only snuck into the Florida State League playoffs -- after going 28-40 in the first half and 40-29 in the second -- the club also won the league title. This was no coincidence. Lewis' combination of hit tool and plus-plus speed has made him the No. 7 overall prospect. Kirilloff, with his elite offensive abilities in terms of hitting and power, stands at No. 10. No other farm system has two prospects in the top 10. The state of Minnesota may have to consider renaming the Twin Cities after the pair in the future. 6. The Class of 2018 can hit. Usually it's best to throw out first-season statistics for Draft picks. They're coming off long high school or college seasons. They're just learning how pro ball works. If they're coming out of college, they might be facing inferior competition than what they saw in, say, the SEC or Pac 12. But every once in a while, Draft picks can do enough to hit the ground running that it forces us to turn our heads, and that happened quite a bit in 2018. No. 2 pick Joey Bart might have been the best of the bunch, belting 13 homers and posting a .983 OPS in 45 games with Class A Short Season Salem-Keizer. No. 19 selection Nolan Gorman also showed his power will translate quite easily when he finished with 17 blasts between Class A Peoria and Rookie-level Johnson City after only turning 18 in May. No. 6 pick Jarred Kelenic shot out of the gate with a .286/.371/.468 line, 22 extra-base hits and 15 steals in Rookie-level ball, and now he might be the best pure hitter in the Mariners system following his trade from the Mets. College picks Nick Madrigal (No. 4) and Travis Swaggerty (No. 10) lived up to their reputations after diving in. These hitters were always going to be must-follows in 2019, but if this is how they can start their Minor League careers, it'll be a wonder to see what they can do when they're fully settled. 7. Selling off prospects can work. When Red Sox president of baseball operations Dave Dombrowski took over in August 2015, the Red Sox boasted then and future Top-100 prospects Yoan Moncada, Manuel Margot, Javier Guerra, Anderson Espinoza, Logan Allen and Kopech as well as interesting prospects such as Mauricio Dubon and Luis Alexander Basabe. No one in that group is left with the club or in its system as Dombrowski made big moves for stars like Chris Sale and Craig Kimbrel. It's highly unlikely he would undo those deals now. This year, Boston won 108 games and its fourth World Series title since 2004. While prospects have obvious currency in today's game, this is something to remember next time anyone worries about a club overpaying with young talent to help the Major League club right away. 8. Prospect trades might not be what they once were. This was covered in the Winter Meetings preview and backed up by last week's three-team trade between the Indians, Mariners and Rays. Big offseason deals often include top prospects going the other way, but that hasn't really been the case of late outside of Justus Sheffield, Justin Dunn and Kelenic going to Seattle. When the Phillies traded for Jean Segura, they didn't send the Mariners Adonis Medina or Adam Haseley; they sent graduated prospect J.P. Crawford. Paul Goldschmidt, one of the best first basemen in the game, didn't bring a Top-100 prospect back to Arizona; instead, it was graduates Carson Kelly and Luke Weaver headlining that side. Jake Bauers would have been a big prospect to move from Tampa Bay to Cleveland if he hadn't graduated from prospectdom in July. Rebuilding teams always value years of control, and they can get that just as easily from young Major Leaguers, while having a better idea of how they can handle the top level. A J.T. Realmuto trade for prospects alone could blow up this theory, but it's given us at least something to think about as December turns to January. 9. Keep your pitching prospects close. The 2018 season was a tough reminder of the fragility of young arms can be and how much of a bummer significant injuries can be. Rays right-hander Brent Honeywell and A's southpaw A.J. Puk would have likely pitched in the Majors in 2018, but both missed the entire season with Tommy John surgery. Hunter Greene's first full season was scarred when he was shut down with a right elbow sprain in August. (He's hoping to avoid surgery with rehab.) Similarly, 2017 third overall pick MacKenzie Gore never seemed to get up to full speed due to blister problems. Soroka debuted in the Majors before being shut down with a shoulder injury. Kopech also made The Show before his own Tommy John procedure. Alex Reyes seemed to be on his own Tommy John comeback trail, only to need lat surgery in June. The list went on and on in 2018. Here's hoping for better health in 2019. 10. Wander Franco could be The Next Big Thing. The Rays signed the switch-hitting shortstop out of the Dominican Republic on July 2, 2017, and only one year later, he's already on the lips of every prospect follower in the game. Tampa Bay sent the 17-year-old stateside for his first season, and he ended up being the Appalachian League's best hitter. Franco finished with a .351/.418/.587 line, 11 homers and a 19/27 K/BB ratio in 61 games with Rookie-level Princeton. He jumped from outside the Top-100 list to his current spot at No. 14 by showing above-average hit, power, run and arm tools. If he can reproduce those results at a full-season level, Franco has No. 1 overall prospect potential. Imagine saying that in April before he'd played his first Minor League game. 11. Do not sleep on the Rays, in general. Most of this was covered in the MiLBY feature for Top Farm System, but some of it is worth reiterating. Tampa Bay has five Top-100 prospects at present (Franco, Brendan McKay, Honeywell, Jesus Sanchez, Matthew Liberatore) while Shane Baz, Ronaldo Hernandez, Vidal Brujan and Shane McClanahan are all close to that distinction. It graduated Bauers and Willy Adames and nearly did the same with Brandon Lowe after a breakout year. As a group, Rays affiliates posted the best winning percentage in Minor League Baseball at .604; the Astros were second at .562. The Rays may not have been in the stratosphere of the Padres and Braves at the beginning of the season, but the gap's smaller now. Don't be surprised if the same could be said in the AL East with the Red Sox and Yankees next year. 12. The Angels system is one to reckon with. This felt like such a theme all season long that it may be difficult to remember the time when the Halos system was one of the worst in the game. Now it boasts one of the toolsiest outfield prospects in Jo Adell and two more Top-100 prospects in Griffin Canning and Brandon Marsh. Matt Thaiss and Taylor Ward provided some hitting intrigue toward the top levels while Jose Suarez did the same on the mound. Patrick Sandoval was picked up from the Astros for Martin Maldonado and finished with one of the best statistical pitching seasons in the Minors -- a 2.06 ERA, 145 strikeouts and 29 walks in 122 1/3 innings across three levels. Trout will need help to break through with his first postseason win, and right now, it's looking better than ever that that help could come internally. 13. The Mariners could be next. The Seattle system seems to be about where Los Angeles was two years ago. The Mariners finished at the bottom of MiLB.com's Farm System Rankings at the start of 2018, and little happened during the season to budge them from that spot. They ended the season without a Top-100 prospect with only the oft-injured Kyle Lewis and 2017 first-rounder Evan White coming close. That's changed as GM Jerry Dipoto kicked a rebuild into high gear. The club dealt James Paxton, Edwin Diaz, Robinson Cano, Segura, Mike Zunino and Alex Colome, and among the returns have been the aforementioned Sheffield, Kelenic and Dunn. Those three alone aren't enough to make the M's a top-10 system, but it's certainly a start. If Seattle can see more jumps -- look for Logan Gilbert and Julio Rodriguez -- then the system could continue its climb in 2019. It'll need that if betting on young talent is to be successful. 14. Peter Alonso is, uh, quite powerful. Last spring, Alonso seemed a bit of a question mark after missing much of 2017 with a broken hand. Now he's more of an exclamation mark. The Mets' No. 2 prospect tied for the Minor League lead with 36 homers between Double-A Binghamton and Triple-A Las Vegas. His final shot -- a two-run walk-off homer on Sept. 3 -- was one for the books as it not only closed out the 51s' season but also their time at Cashman Field. The 24-year-old first baseman should have finished the season in the Majors, and new Mets GM Brodie Van Wagenen has made it fairly explicit that New York plans on relying on Alonso early next year. It's possible Alonso wins the first-base job right out of Spring Training -- thus throwing service-time concerns to the wind. Everyone should believe if and only if they see it, but trading Jay Bruce to Seattle was a positive sign along those lines. 15. Juan Soto was an inspiration. Enough about prospects who should have been in the Majors. How about one who made it earlier than anyone expected? Soto entered the season as a 19-year-old who had played only 83 games over two seasons in the Minors. He had shown a good hit tool in that limited look, forcing anyone following the Nationals system to at least keep tabs on him early on. He quickly showed more than just a good hit tool. The left-handed-hitting outfielder moved up from Class A Hagerstown to Class A Advanced Potomac on April 23 after just 16 games and then moved on to Double-A Harrisburg after 16 games there. Following only eight contests with the Senators, he was in the Majors. Over his 39 games in the Minors, Soto batted .362/.462/.757 with 14 homers and a 28/29 K/BB ratio. The Nationals had seen enough and pushed him to the Majors, joining a lineup with Harper, Anthony Rendon and Trea Turner. The move didn't help Washington conquer the NL East, but it certainly didn't hurt as he finished second in the NL Rookie of the Year voting to Acuña. Hope others were paying attention to what happens when an organization trusts an elite teenager. 16. The Marlins still don't quite look like a breakout system, but that could change. Last year around this time, Miami conducted a fire sale with its new ownership group trading away stars like Giancarlo Stanton, Christian Yelich and Marcell Ozuna. The result: The Marlins are the only farm system at present without a Top-100 prospect. Part of the problem was the graduation of Lewis Brinson during the season. Another was the dropping stock of players such as Monte Harrison, Isan Diaz and Trevor Rogers. Miami simply doesn't have the look of a system that can contend on prospects alone. That said, the arrow is pointing up. The Fish added Victor Mesa out of Cuba in October, and the 22-year-old outfielder, who possesses plus run and fielding tools, immediately moved into the top spot in the Marlins' prospect rankings. Also if Miami can pry top prospects from another system in the Realmuto deal everyone expects to come soon, then there will be even more life on the farm. 17. The Orioles are becoming a system to watch. It's clearly a new era in Baltimore. Gone are players like Manny Machado, Adam Jones, Kevin Gausman, Jonathan Schoop and Zach Britton. The club signaled it was ready for a rebuild when it dealt Machado to the Dodgers, picking up No. 52 overall prospect Yusniel Diaz and four more in the process. They continued that with the departures of Dan Duquette and Buck Showalter. In their place are new GM Mike Elias and new manager Brandon Hyde. Hyde has a history of working in player development with the Cubs, while Elias helped guide the Astros rebuild a few years ago. This is a group prepared for the long haul. The O's boast two Top-100 prospects in Diaz and No. 63 Ryan Mountcastle and have a few other interesting names in Austin Hays, DL Hall, Dillon Tate and Luis Ortiz. They also made two Rule 5 picks -- infield prospects Richie Martin and Drew Jackson -- a clear sign the new group is willing to give young talent a shot. The Major League team might not have the assets to flip into more big-time prospects, but these players could help develop some from within. Also, it won't hurt to have the No. 1 overall pick next June. 18. The extra innings rules ... are fine. Back in March, Minor League Baseball announced new extra-inning rules aimed at curtailing game times, thus protecting bullpens and players in general from working deep games that could result in injuries and hamstrung rosters.All teams started extra frames this year with a runner on second base and no outs. The idea was that would lead to more runs, more runs meant fewer extra innings, fewer extra innings meant fewer injuries or tough roster calls. To some, it seemed an apocalyptic decision. In reality, the move worked. In 2017, 973 games went to extra innings and lasted an average of 3 hours, 32 minutes. In 2018, 830 games went to extras and lasted an average of 3 hours, 16 minutes. That also was 19 minutes quicker than 2014, 13 quicker than 2015 and 14 quicker than 2016. Through July 1, 2017, 162 games went longer than three extra innings. Through July 1, 2018, that number was all the way down to eight. It's unlikely to affect the Major Leagues any time soon, but in the Minors where player development is paramount over wins and losses, the new extra-inning rules did what they intended to do.